Advance Happy New Year to everyone! New Year means New Dear errr Money, for our beloved country! Yehey! We have a new set of design for our money, unveiled yesterday by no less than Pres. 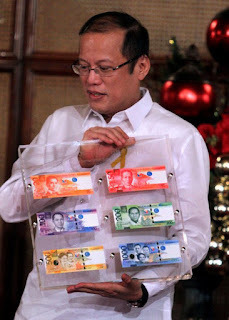 Pnoy Aquino and the BSP. 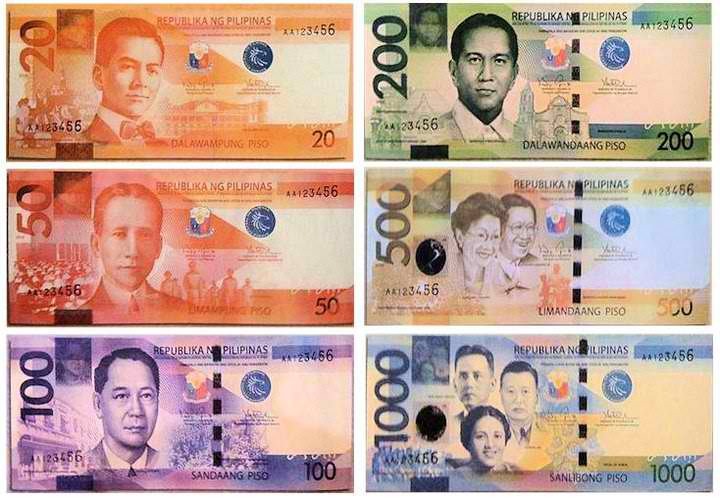 We have a total of six denominations; P20, P50, P100, P200, P500, and P1,000 bills which now have a new design. They were especially designed, and have an upgraded security features so the public would easily detect if the money is real or fake. We still have 3 more years to use the old design before it would demonitized. So rock on! 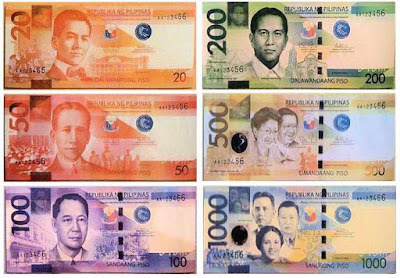 the word “Pilipino” written in "Baybayin", a pre-Spanish writing system both at the front and the back, The alibata—the country’s native alphabet—meanwhile, was printed on the lower right of the bank notes, slightly below the watermark print of the heroes’ or past presidents’ photographs. "woven cloth" design, which is different for each denomination. The quotation, believed to be approved by various religious sects, states: “Pinagpala ang bayan na ang Diyos ay ang Panginoon ( Blessed is the nation whose Lord is God).” printed on the mid-upper right part of the new bank notes, just above the logos of the Philippine republic and the BSP. monochromatic color schemes in some parts of the bank notes. hygienically treated, making them less prone to sweat and dirt. This makes 3 Aquinos in the new P500 Peso Bill because, PNOY, as the Philippine president, is the one who signed the official bank note. According to PNOY, "The last time I checked, no other bank note all over the world has both parents and his son in the same bank note." This new face of P500 peso bill created a new record and history for Filipinos. The winning bidder for the production of the bank notes was Oberthur Technologies. The contract cost 25.3 million euro, the BSP gives the firm until the middle of next year to deliver some 702 million pieces of new bank notes. According to the source of the BSP is slating to launch the bank notes this month, and will start circulating them next year. Oberthur was also able to produce the bank notes only eight weeks after it received the new designs. 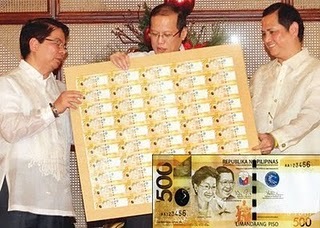 The BSP was further pleased with the cheap production cost of the new bank notes. The P20 and P50 denominations will cost P1.50 each to produce; P100 at P2 each; and the P500 and P1,000 denominations at P3.50 each.